Hot drinks and booze. What more could you ask for this holiday season? Islands is offering these specialty drinks just in time to help you “get through the holidays” and I took it upon myself to try them out. You know, for you guys. For research. Totally. There are three coffees to choose from. Each one brings a little something different to the coffee. 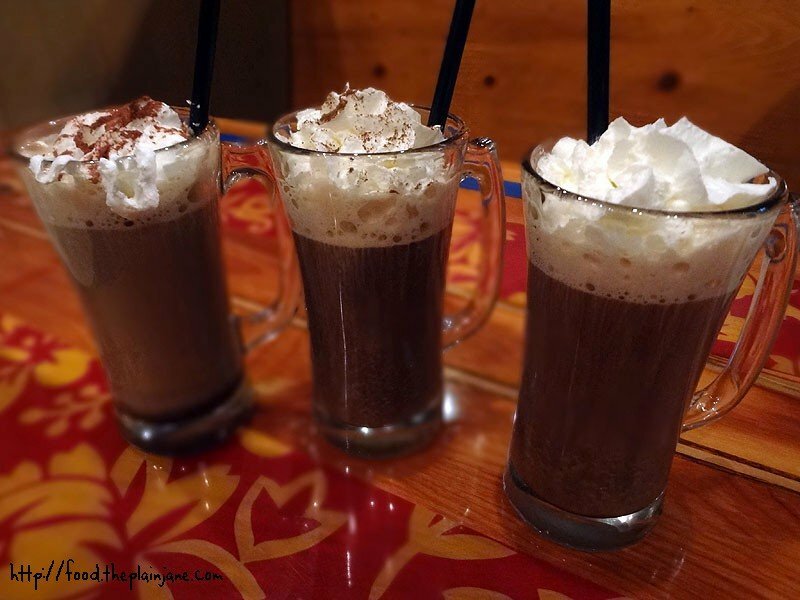 If you come and have all three together (it is the holidays after all, I honestly wouldn’t blame you), heed my advice and start with the Irish Coffee first. The punch of whiskey will really wake you up and considering there’s no other sweetener (besides a dallop of whipped cream), you should go from bitter to sweet. Jake and I didn’t do that though. We started with the chocolate sweetened Cocomo and went backwards. By the time we got to the Irish Coffee, we were both making bitter faces. The Cocomo (seen here, in my face) Coffee was my favorite of the bunch. It was creamy thanks to the Bailey’s plus the chocolate gave it the perfect amount of sweetness. 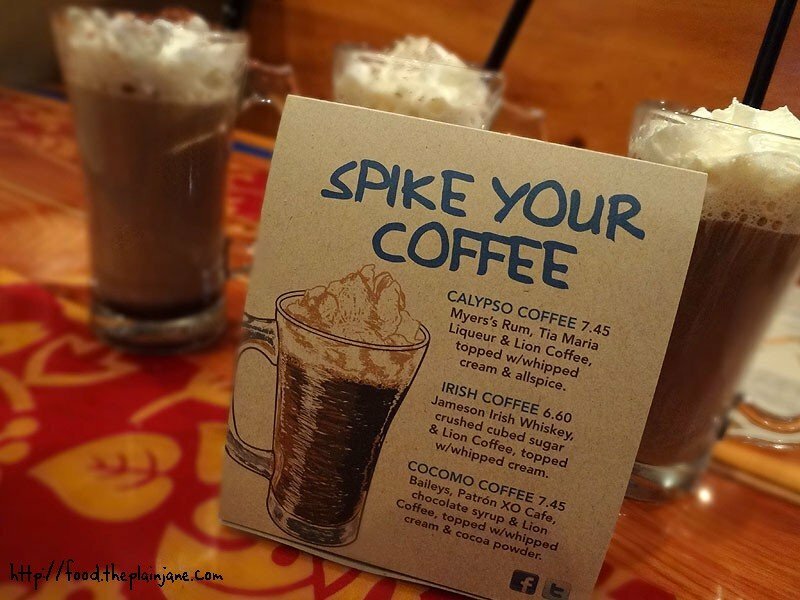 The Calypso Coffee was nice with the touch of rum and allspice on top, but once I had that chocolatey one, I was done for. 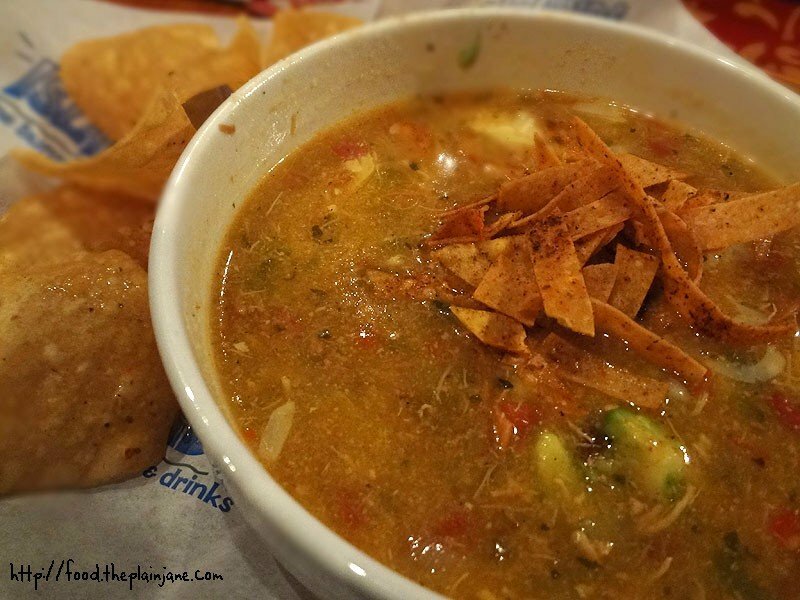 I also ordered a bowl of Island’s Chicken Tortilla soup – because I love it so. Once, Jake and I went to Islands for dinner and shared the endless Chicken Tortilla soup bowl and a basket of endless fries. We were quite content, let me tell you. What I love about this soup is the little chunks of avocado in it. It’s like “Surprise! Avocado!” And, when I share this with Jake, I get to have all of the avocado since he’s weird and doesn’t like it. Yay for boyfriends with weird aversions to things you love! We also shared the cheesy fries. With added bacon, of course. I prefer the plain fries. 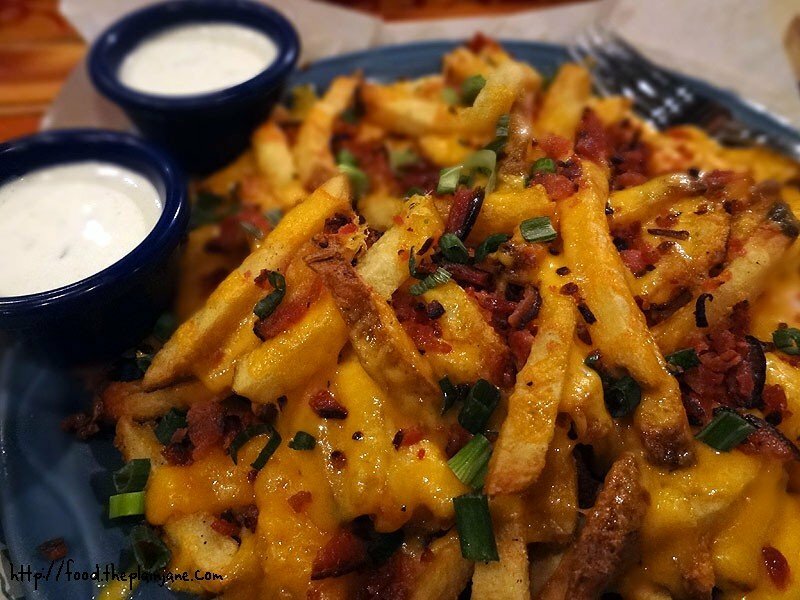 The cheese started to get cold and harden on the fries and I don’t really like that. It makes the fries have this weird, almost glue-like texture. Cold, melted cheese is nobody’s friend. Jake really liked them though. He doesn’t care about cold cheese, unlike me. We also ordered a turkey burger and split it. This isn’t the turkey burger though. I don’t really like the turkey burger. There are bell peppers and applesauce and I just don’t enjoy the flavor. I will say though that this time it did taste better than I’ve had it in the past – but I still didn’t like it. Instead, this is a picture of the Wedge – their version of a “BLT” on one of their tasty buns – all covered in melty cheese. I added avocado slices to this, too. 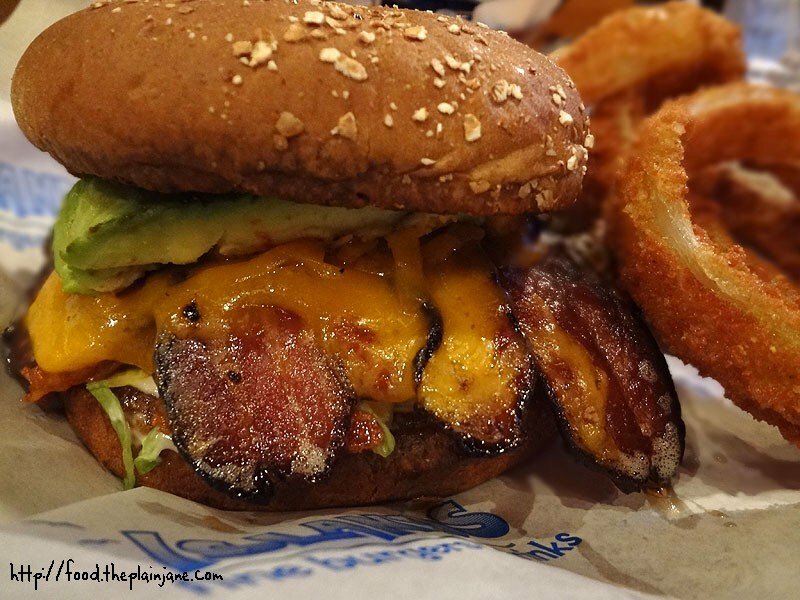 You know me – avocado love! The bacon was thick cut and cooked just right with the perfect amount of crispiness on the edges. All in all a fun dinner and Jake and I got to try a few new things and some boozy, warm drinks. This holiday season if you purchase a $50 gift card from Islands, you’ll get a $10 bonus card for you to use in January. Gift cards are available at all Islands Restaurants or by purchasing them online. 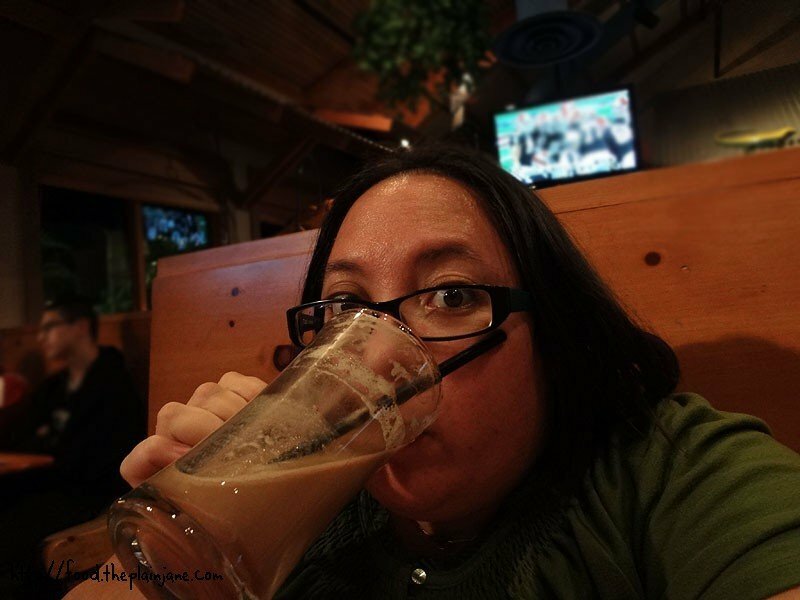 Disclaimer: I was provided with a complimentary dinner and drinks by Islands Restaurant. I was not paid for my review and all opinions and statements are my own. Hi Frank – Yes, it’s true. But we still all gave our honest opinion (I hope).